So I was taking a look at VRC6 emulation when I noticed the intro screen here. I'm not sure if this is a known issue, I couldn't find it in a few basic searches. I don't see the issue in youtube videos of the game either. Anyone have any idea what the problem is here? Being off my 3 scanlines seems like a lot. I have this game cart! 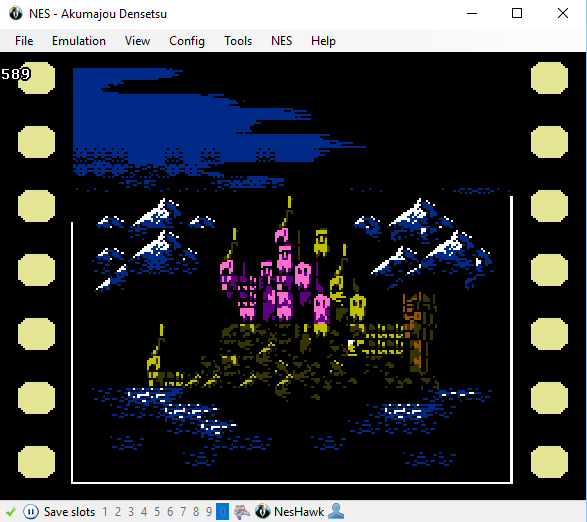 Thanks for the testing, but I can't quite tell from the video, is there still a couple of pixels left at the bottom of the clouds just like in emulator? Or is it different in some way? Also I'm surprised they let that super shaky white line on the left side of the screen pass in development, seems sloppy for konami. Which version? 1.40 looks identical to the screen shot above. I couldn't access the video! Last edited by NewRisingSun on Tue Dec 19, 2017 4:02 pm, edited 1 time in total. Night to return to Beijing ,I'll test at the machine again! Huh, so it really does look like that. Seems pretty conclusive, thank you for testing zxbdragon. If I'm not wrong, VirtuaNES does such effect 100%. Remember - he tested it in a famiclone. It hasn't even VRC6 sound support.